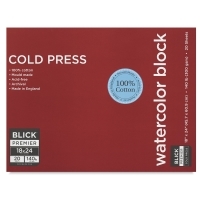 At Blick, we pride ourselves on providing artists with high-quality materials at competitive prices. 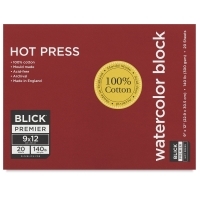 The paper in our Blick Premier Watercolor Blocks is made on a traditional cylinder mould in a European mill that has been making paper since the 1700s. Both internally and externally sized, its surface is created using natural woolen felts, helping it withstand scrubbing and other wet techniques without tearing. 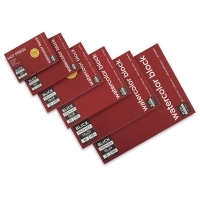 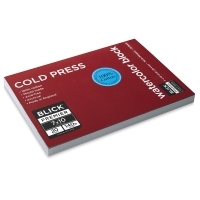 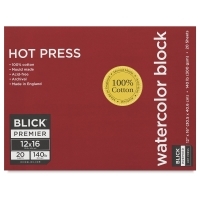 Blick Premier Watercolor Blocks are glued on all four sides, keeping the sheets flat and wrinkle-free. They're great for painting on location — no soaking required!